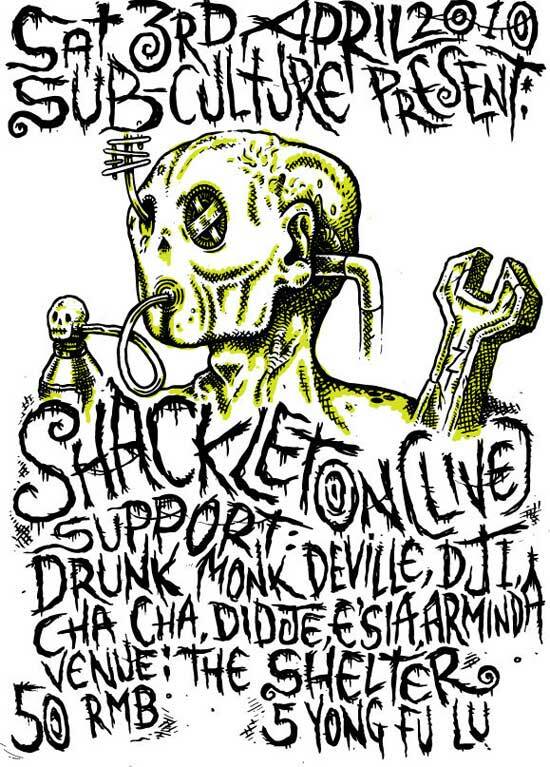 Back in April 2010, Sub-Culture brought Shackleton to China for the first time. This was a big deal for us, we had wanted to book him since the early days of Shelter but as he rarely travels outside of Europe it wasn’t possible until he decided to do his first world tour in 2010. Understandably excited about the event, we wanted to make a special poster for the occasion and so contacted Skull Disco artist Zeke Clough to see if he would be interested in doing the design. To our delight he agreed and the result (above) totally blew us away. It was by far the best poster we had done for any of our events up until then and we felt that simply printing regular posters wasn’t enough. 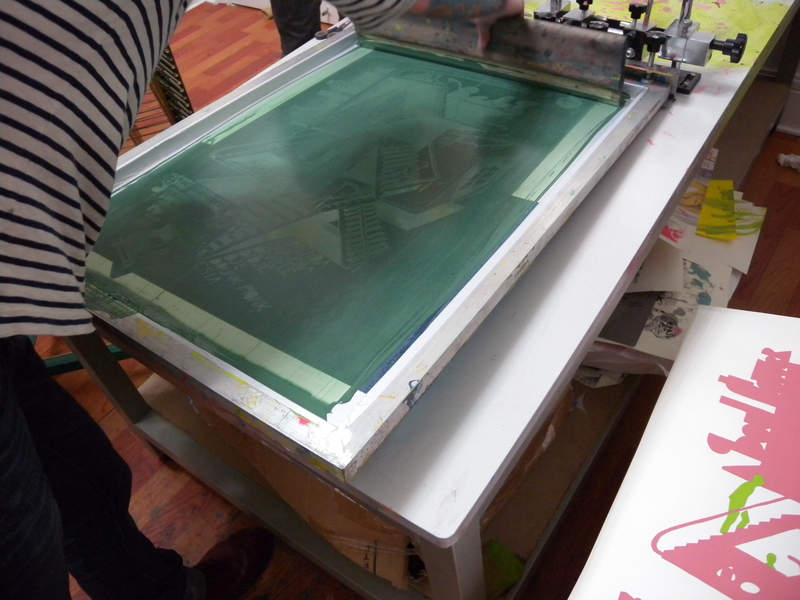 Around the time we had received the poster from Zeke Split Work’s Jue festival was in full swing and one of the events included a workshop from a new screen-printing studio called Idle Beats. I have been a collector of screen-prints for many years and so was excited to have finally found someone doing it in Shanghai and so contacted Nini Sum to see if she would be interested in collaborating and producing a print of Zeke’s poster. Nini was up for it and so for the event we produced a short run of hand-pulled posters. We really enjoyed working together and so decided to do it again the following month when we hosted Clouds and Desto from Finland. 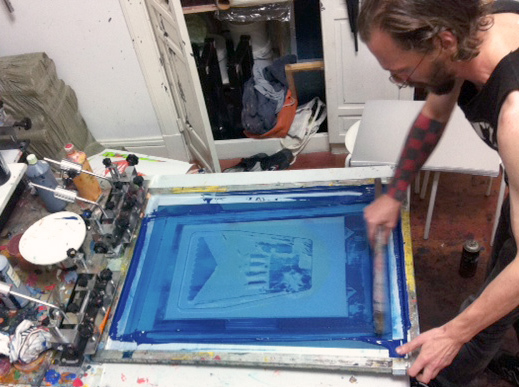 Gregor Koerting had just joined Idle Beats and had an idea for a poster and so he designed our second screen print. Again, the project was a success and Gregor’s poster sold out pretty fast. And so we did it again the month after. And the month after that. And the month after that. We have now been working together for just over 3 years and have produced over 40 screen-prints designed by artists from all over the world. This Sunday at On Stage sees the first time we have exhibited all the posters together. All available posters will be for sale at a special price just for the event, and Idle Beats have put together 20 mystery tubes for only 50rmb, containing a random poster from our collection! 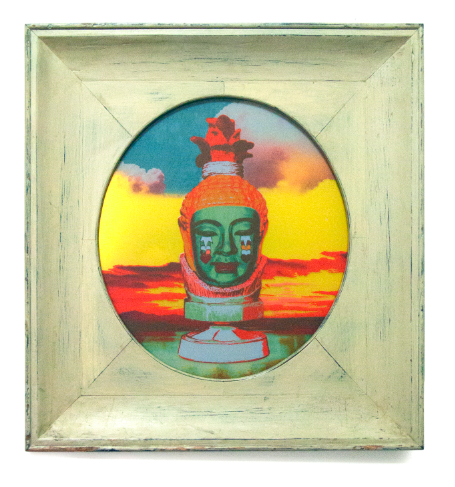 Get down early and grab a great piece of art for your wall! This year we are taking Halloween a little more seriously with a special screening of 2 incredible pieces of film, one from 1920’s Sweden and the other from 70’s Britain. Doors will open at 8pm, with the first screening at 9.15pm. There will be limited tickets/seats available as we want everyone to be comfortable and have a good view of the screen. Once all the tickets have been sold, or 5 minutes before the first movie, the doors to Shelter will be closed, lights will be turned off and mobile phone coverage will be disabled. Advance tickets will be available from Sub-Cinema every Tuesday night at Dada throughout October or you can email us at subcultureshanghai@gmail.com to reserve. 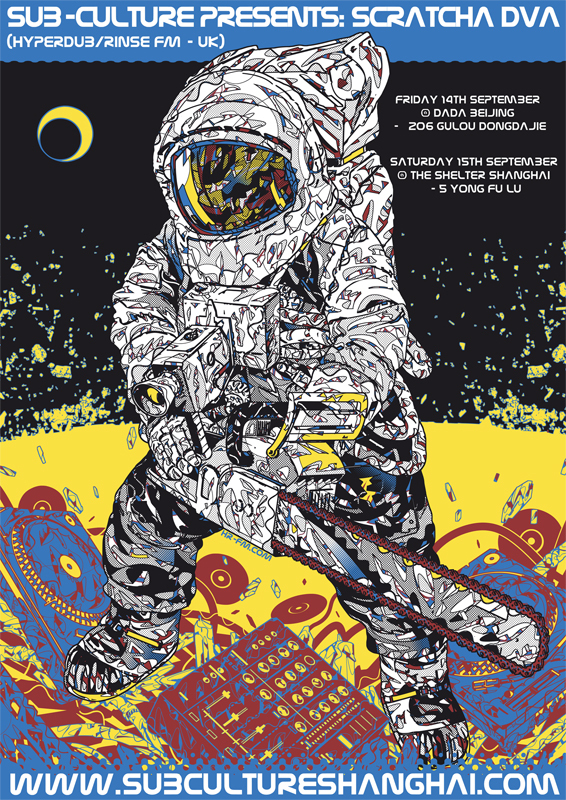 Tickets are 50rmb, and include a special limited edition, silk screened art print designed by Idle Beats’ Gregor Koerting. These prints will only be available to ticket holders and will not be on sale/available anywhere else. Attendees will also have the first chance to purchase a second movie poster before it goes on general sale, and which will be unveiled by the artist on the night between the 2 movies. The theme of the evening is ‘Witchcraft’, a belief that existed in some form (and in some places still does) in many cultures around the world. The first screening will be ‘Haxan’ from 1922, and this will be followed up by ‘The Blood On Satan’s Claw’ from 1971. Häxan (English title: The Witches or Witchcraft Through The Ages) is a 1922 Swedish/Danish silent horror film written and directed by Benjamin Christensen. Based partly on Christensen’s study of the Malleus Maleficarum, a 15th-century German guide for inquisitors, Häxan is a study of how superstition and the misunderstanding of diseases and mental illness could lead to the hysteria of the witch-hunts. The film was made as a documentary but contains dramatized sequences that are comparable to horror films. In the version we will show, Bristol’s Bronnt Industries Kapital recently rescored the film adding even more to the already creepy and atmospheric style. After a plowboy accidentally unearths the skeletal remains of a demonic creature, a cult of teenage devil-worshippers emerges in a 17th-century Cornwall farming community, led by the gorgeous temptress Angel Blake. Together, the children begin performing blood sacrifices in order to bring the skeletal demon back to life, and the superstitious locals attempt to use inquisition-style practices to put a stop to Angel’s cult. A highly regarded piece of British cinema, yet rarely seen, this lush, moody horror is superbly written and is still as shocking as it was back in 1971. The film was originally intended as a three-part series, but was eventually edited down to one feature. Blood On Satan’s Claw ranks alongside ‘The Wicker Man’ and ‘Witchfinder General’ as one of the best horror movies to come out of Britain in the 1970’s. We are very excited to be showing this movie in the darkness of The Shelter. Imagine a head-on collision between freestyle rhythms, soundsystem shaking bass, emotive chords and unusual sampling tactics… or just forget about it. 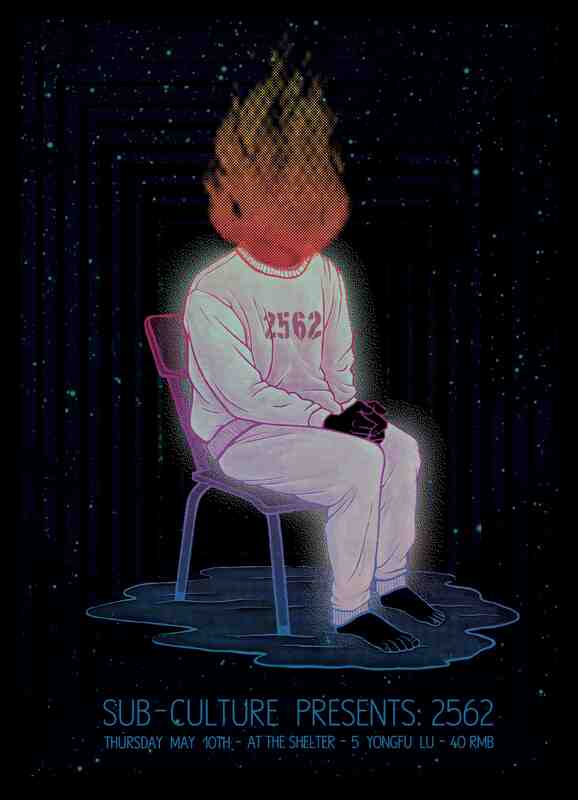 The music of 2562 – aka Berlin-based Dutchman Dave Huismans, the number being his former zipcode in The Hague – keeps surprising anyone with a keen ear for new electronic music right because it escapes the usual categories. Pacey and futuristic bass transmissions such as ‘Kameleon’, ‘Techno Dread’, ‘Flashback’ and ‘Dinosaur’, released on DJ Pinch’s highly respected Tectonic label, found their way onto the decks of everyone from Kode9, Benji B and Mary Anne Hobbs to house/techno veterans Anthony Shake Shakir, Francois K and Laurent Garnier. Known for a true love of dj’ing, tight mixing skills and wide selection in an uptempo style, 2562 is not another producer-turned-dj, but a proper selector since years, who enjoys making a trip out of a set, mixing up brand new cuts fresh from the studio with unexpected house and techno gems. He plays regularly at high profile clubs such as Berghain/Panoramabar (Berlin), Fabric (London) and The Bunker (New York), as well as bass-strongholds Subloaded, FWD, Sub Dub and numerous festivals and underground nights all over the world – from Australia to Japan and from the USA to Russia. With his new imprint, When In Doubt, 2562 is pushing his sound even further and making it even harder to categorize his unique take on electronic music. Sub-Culture have been waiting for this event for a long long time now, and we are sure it will not disappoint! Last night we went over to Idle Beats studio and caught up with the designer of this month’s poster, artist/ex-punk band member/part time model (check the new The Thing catalogue) – Gregor Koerting, to ask him a few questions about where he’s from and what he’s been up to. Sub-Culture: First of all can you introduce yourself a bit. Where are you from and how did you get into art? 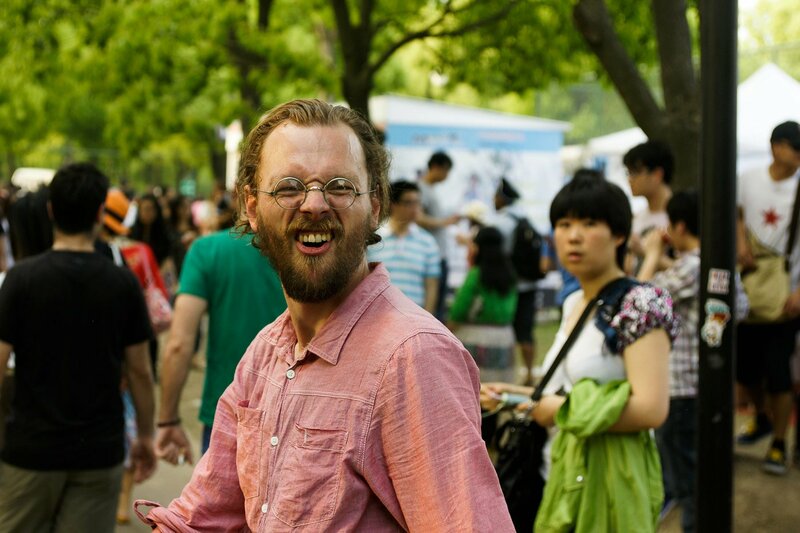 Gregor Koerting: So yeah, im from Dresden in Germany. I’ve been doing this illustration thing now for over a decade now. I started as a teenager doing some graffiti stuff and then I went on to do some simple gig posters for local punk rock bands, covers, skate board designs and later on also some mural art. Over the years I didn’t really leave my hometown, but 3 years ago me and wife decided to move to Shanghai so I started doing illustrations here and getting to know the subculture scene. SC: So how did you meet Nini and IdleBeats? SC: Was that the Split Works event? SC: So can you tell about Spectery? SC: So its just yourself? GK: Actually its myself and my brother. He’s in Germany and studying painting and art in Dresden so we work on this together and put our artwork on this website and that’s all. Im still thinking what to do with this really. SC: Ok, so can you tell us a little bit about this month’s poster? Whats it about? Where did the inspiration come from? GK: I’ve had a lot of inspiration from science fiction and horror the last couple of years, from writers like H.P. Lovecraft and Algernon Blackwood. Im really into this space and horror theme. 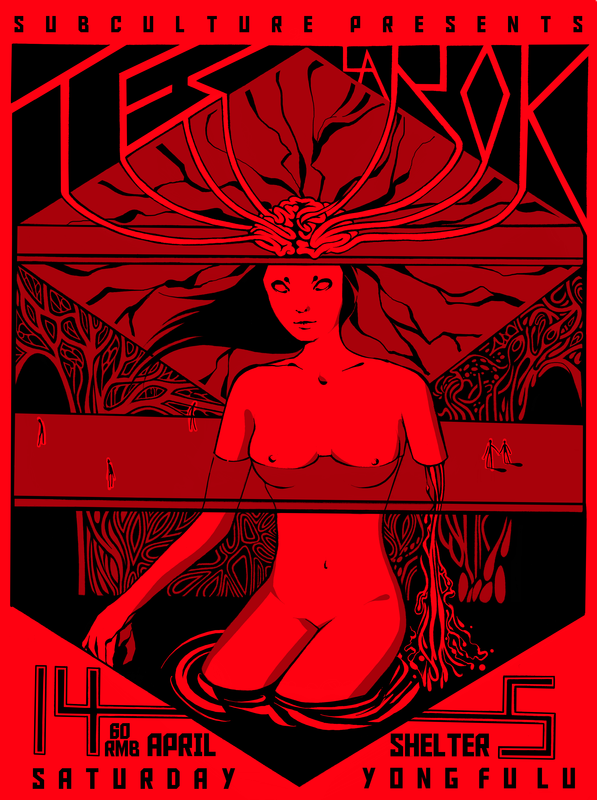 But most of the gig posters I do are inspired by the music and since I’m really into this Witch House thing the last few months this poster was influenced a lot by this. SC: Ok, so finally, what do you have planned after this poster? What projects do you have coming up? 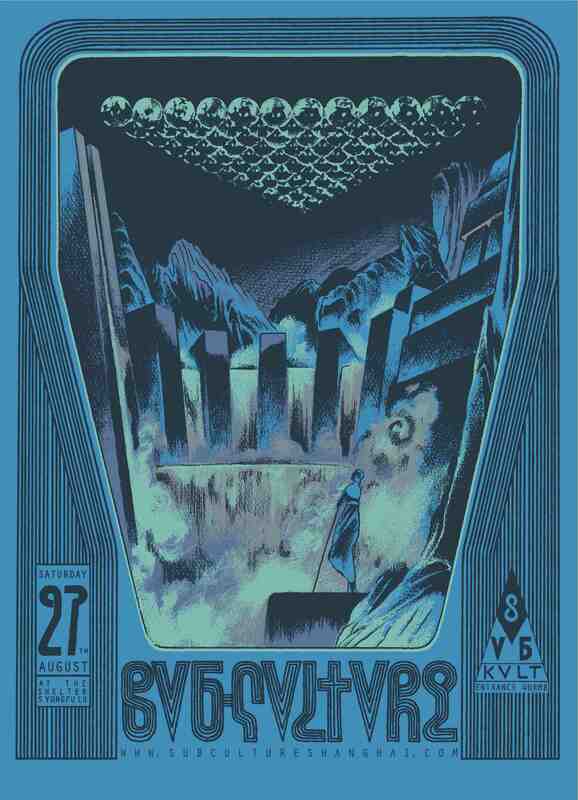 GK: Besides the gig posters we are doing more and more art prints. Our latest one is this one (see above pic). We are also preparing for a gig poster festival in Germany where we have our own booth, so we are getting a lot of work ready for that. 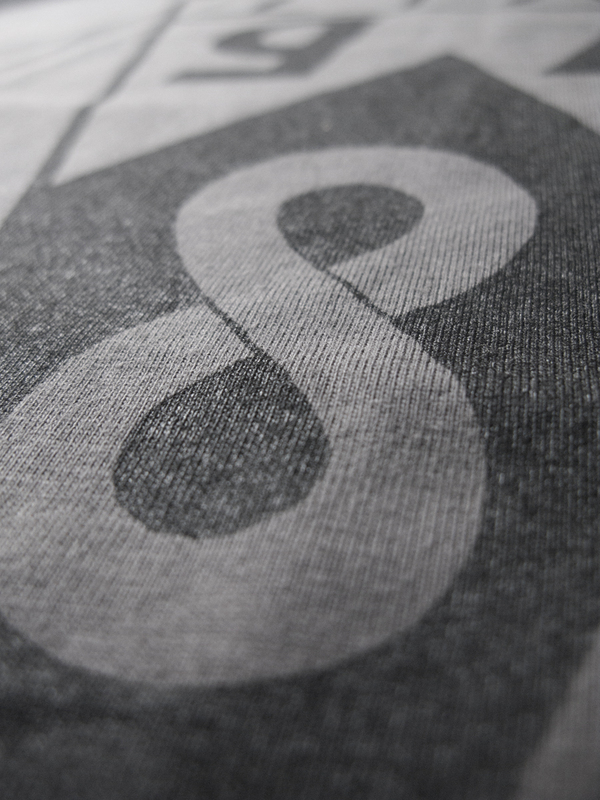 We have a few other projects in mind, such as silk screened books, art books, but this is really a long term project. 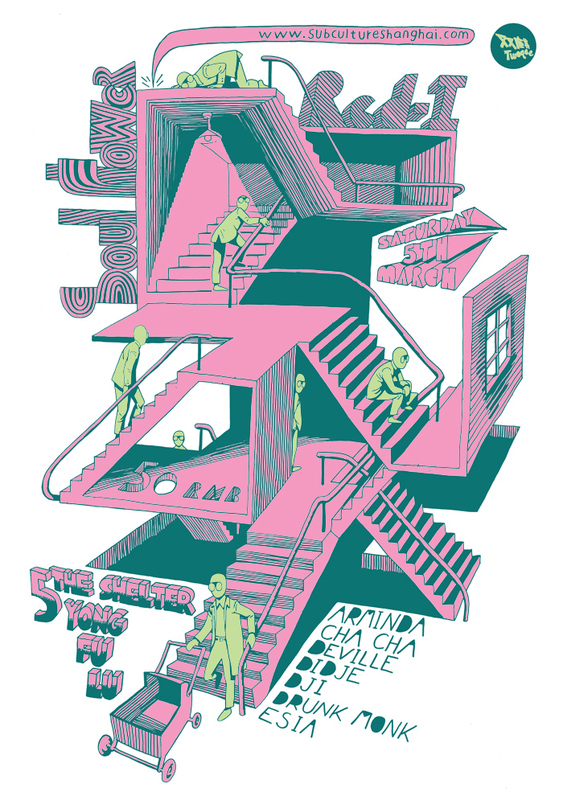 As always, Gregor and Nini will be down at The Shelter at the Idle Beats booth at this Saturdays Sub-Culture with a whole range of great, affordable artwork including this months poster and the new (and selling fast) Sub-Culture T-Shirt, both designed by Gregor. See you there!! Sub-Culture T-Shirts Available This Saturday! 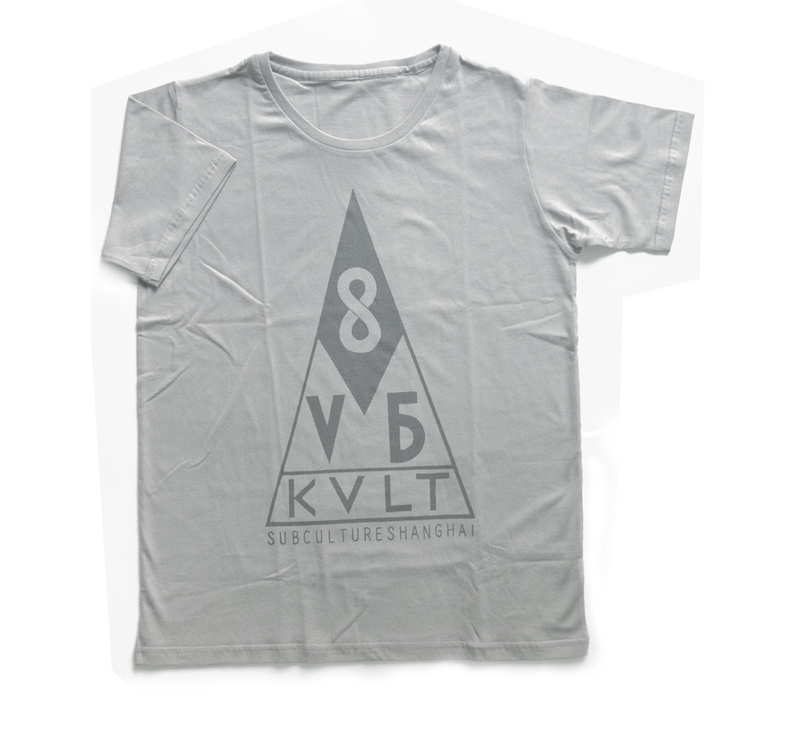 The first in a series of Sub-Culture t-shirts will be launched this Saturday at The Shelter. 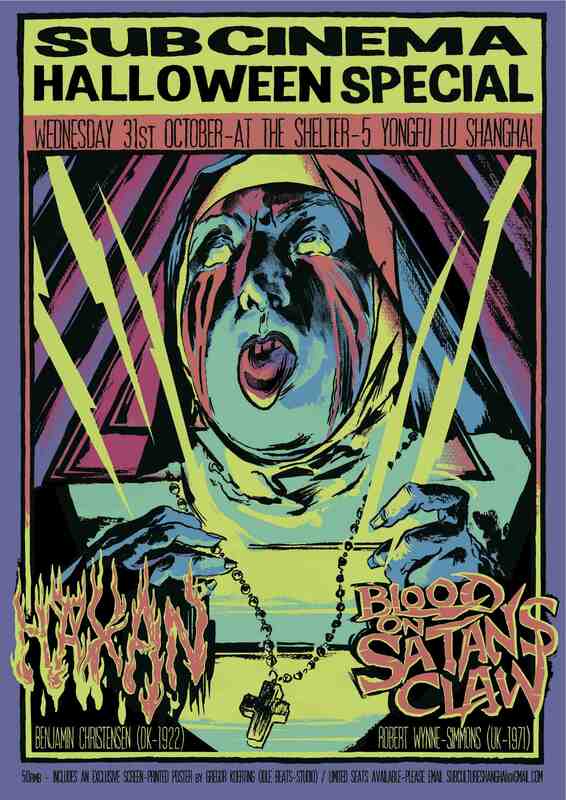 Using part of this month’s gothic fantasy/witch house inspired poster designed by Gregor Koerting, the shirts are hand silk-screened on custom cut high quality shirts in an edition of 50 and are priced at only 100 rmb. Available in light and dark grey, this will be a strictly one time print so once their gone, their gone! 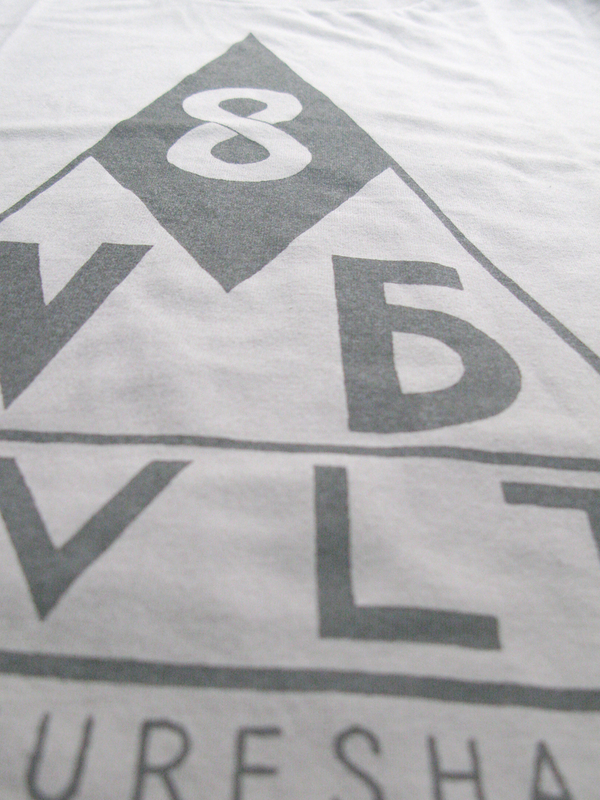 Check back later this week for an interview with Gregor and more info on the design. 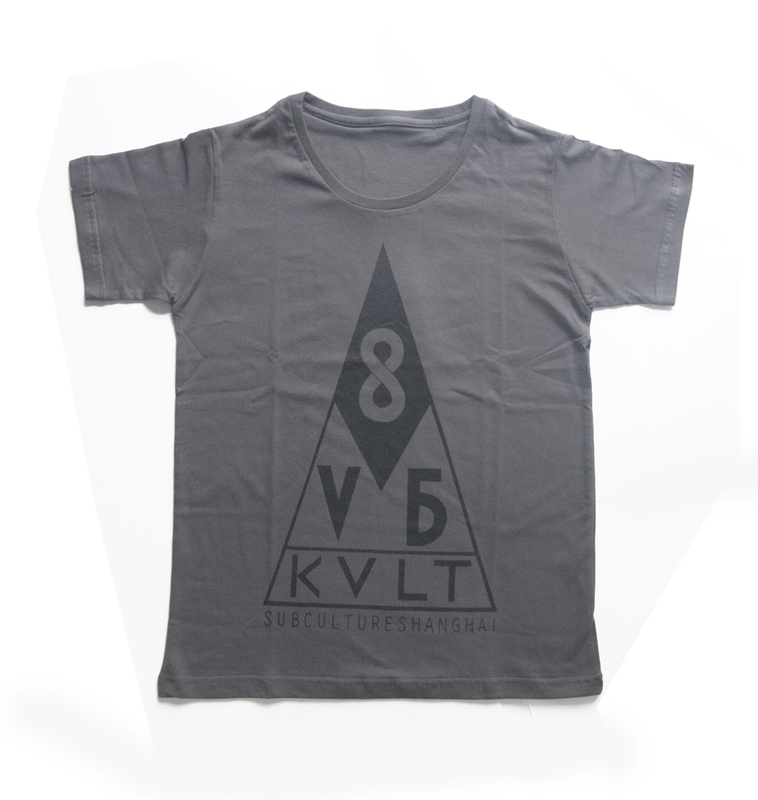 To pre-order a shirt hit us up on subcultureshanghai@gmail.com. 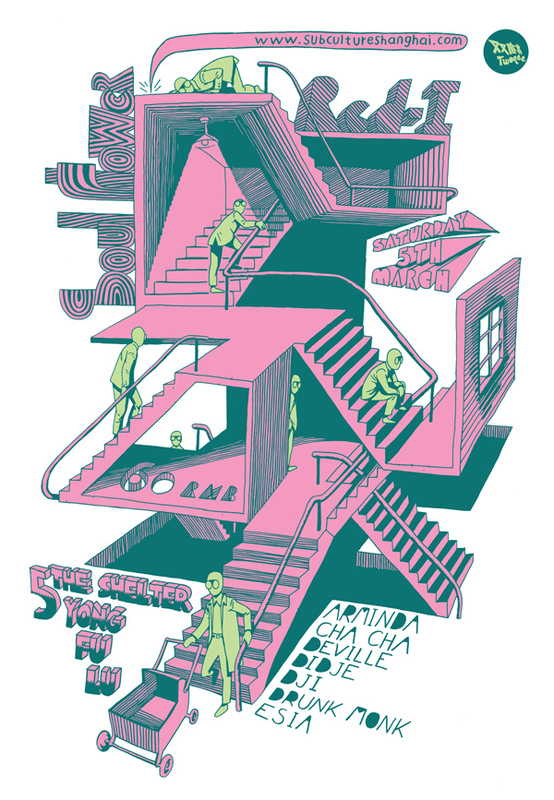 As most of you will know by now, each month Sub-Culture collaborates with Shanghai based printers ‘Idle Beats‘ to produce a limited run of screen printed posters, each month inviting a different artist to do the design. This month’s poster, which we have entitled ‘The Baby Snatchers’ was design by Twoqee from Beijing. Yesterday we went to the Idle Beats studio to meet up with Twoqee to ask him a few questions about the design and to see how the poster was made. Twoqee Guo, from Beijing, is a comic illustrator and creative designer behind the “The Thing” clothing brand, and is also part of the infamous ‘Cult Youth’ comic artist collective (check out this great little video about Cult Youth here). 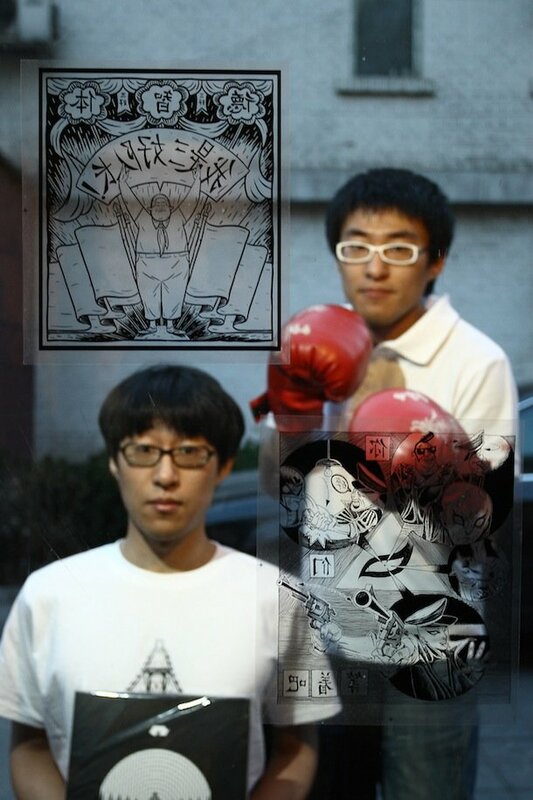 XiaoLongHua (the artist who designed December’s Sub-Culture poster, and who is also a member of ‘Cult Youth’) explains that Cult Youth is a collective of comic illustrators based in Beijing who put out underground comic books, either collectively or individually. 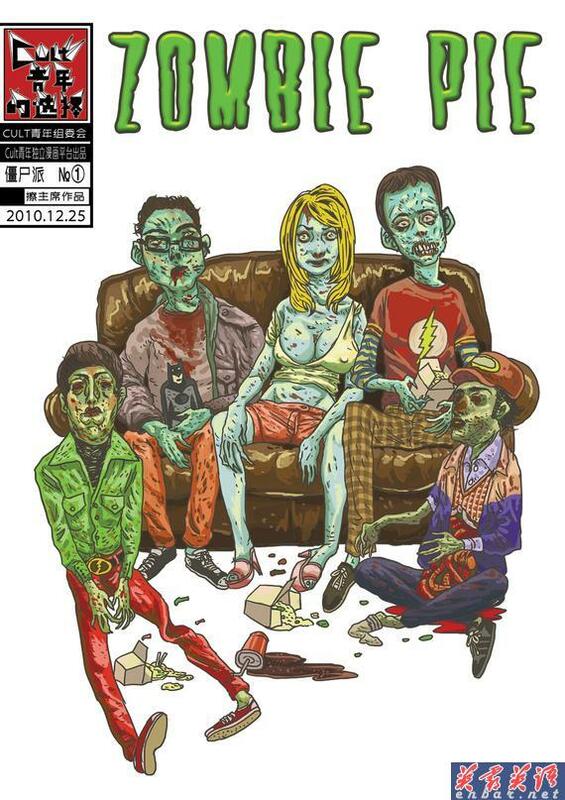 The latest ‘Cult Youth’ comic, Zombie Pie by Chairman Ca, was released last December and is available to buy here , but, as XiaoLongHua explained, they only produce around 1500 of each comic, and all the earlier releases are sold out, so id act quickly if you want to pick one up. When asked about his ideas behind the poster, Guo told us that when thinking about the design he heard a news story about the worryingly increasing number of children being kidnapped and sold in China, and so this is the main inspiration for the image (hence the creepy looking men sneaking around, and the guy walking away with a pram). ‘The design took 3 weeks to develop and then 3 days to draw’ says Guo, who is very happy with its final outcome. So now the design itself is done, the next step is to screen print it. Screen printing actually originated in China during the Song Dynasty (970 – 1279 AD), was introduced in the West during the 18th Century, and only really became popular due to Andy Warhol’s use of it in the 1960’s (thanks Wikipedia). 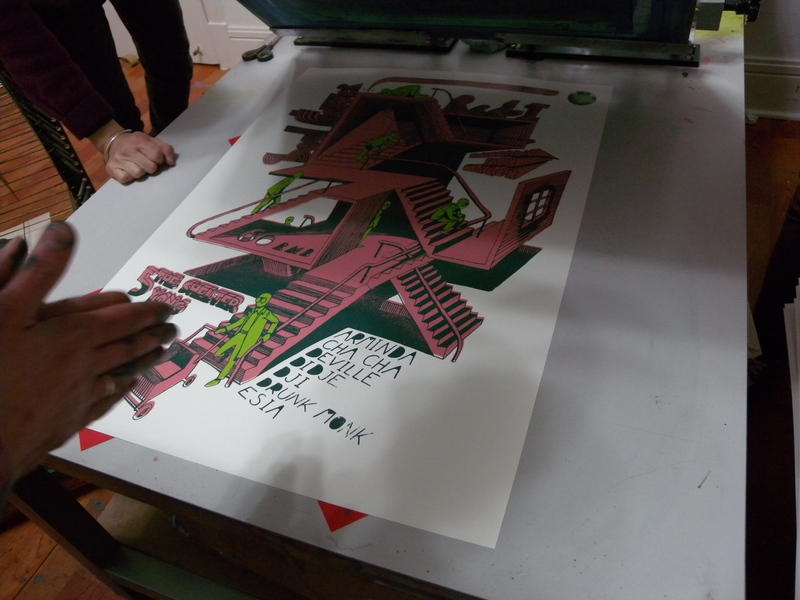 I have been a collector of screen prints for a few years now, but have never really known about the whole process and so it was a pleasure and very interesting to see Twoqee and the Idle Beats crew at work. First off, each colour of the image has to be separated and a screen has to be made for each layer (this design is 3 colours, so 3 layers). Each layer is first printed in black onto tracing paper, and then after the silk screen has been coated in light-sensitive emulsion, the tracing paper is placed underneath the screen in a large exposure machine and is exposed to light for roughly 80 seconds. The reason for this is that the light only shines through the parts of the tracing paper where there is no print, and then the emulsion on the silk screen which is exposed to the light becomes water proof. After the exposure, the remaining non-waterproof emulsion is washed off to leave a kind of stencil of that layer of colour. This is done for each layer, and so we are left with 3 screens. Next is the printing. 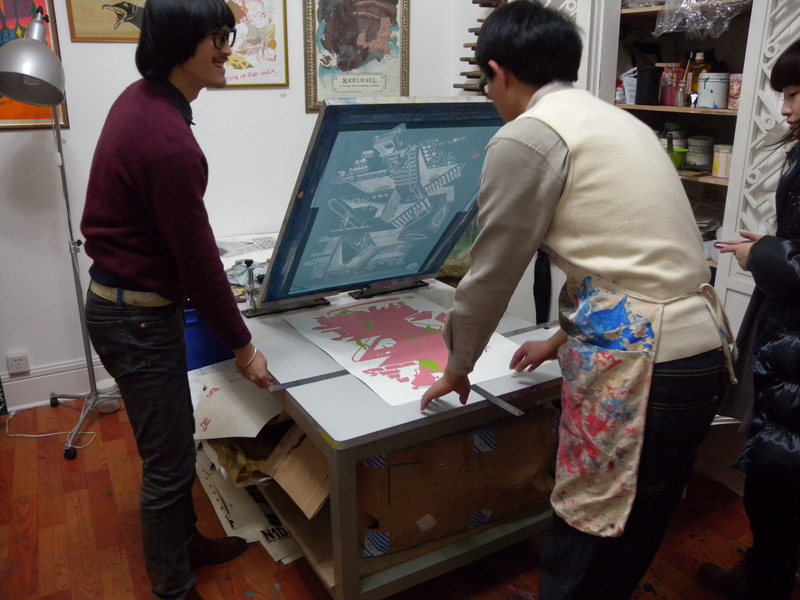 The first step is to print the main background colour (in this case, the kind of pink colour). The paper is laid down underneath the screen (which is attached to some kind of movable vice to keep it in the same position) and the screen is lowered on top of it. 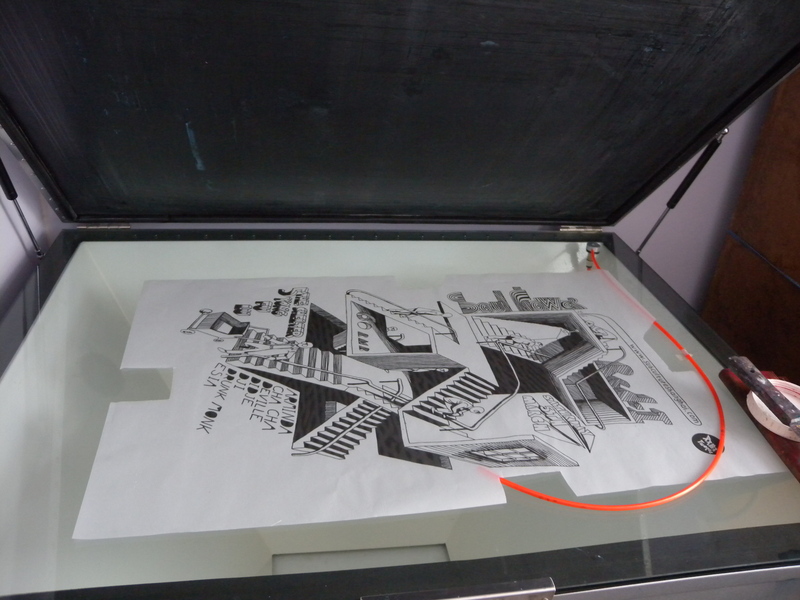 Ink is then poured on to one end of the screen and using a squeegee (a rubber blade) the ink is, quite quickly, drawn across the screen. The ink only goes through the screen where the emulsion was washed off, and so it creates a perfect copy of that layer of colour. Once the ink is dry, this is then repeated for each layer of colour. The tricky thing here is to get each screen exactly aligned before printing, and, as Gregor Koerting from Idle Beats explained, sometimes this can take hours to get it exactly right. It was a really good experience to see how these posters were made, and it made me realise and appreciate the time and effort which goes in to each print. I didn’t arrive at the studio until around 5pm (due to a late night djing with Heatwolves, which was a lot of fun by the way) but these guys had been there since first thing in the morning, and when I left around 8pm they were still hard at it! 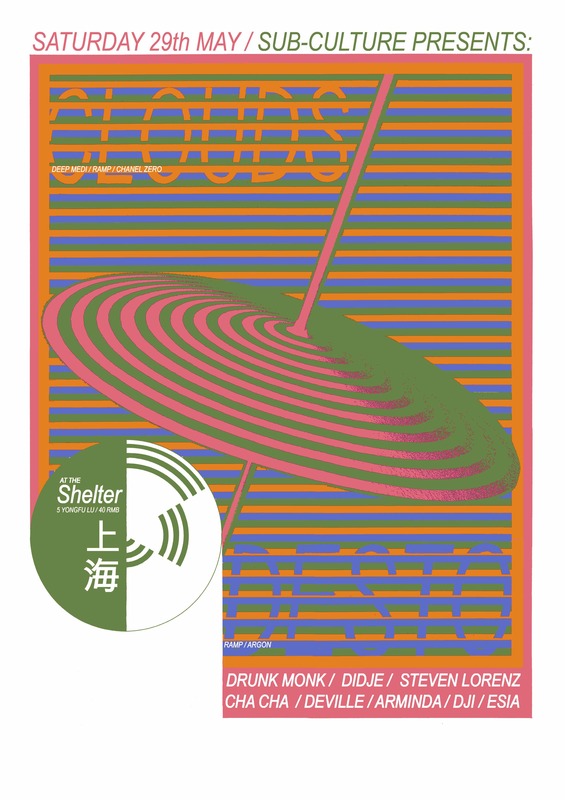 As always, these posters, as well as past Sub-Culture posters, will be available to buy on Saturday night at Sub-Culture @ The Shelter, and also direct from Idle Beats. Idle Beats also run weekly screenprinting workshops, so if you fancy the idea of giving it a go yourself you can contact them here. 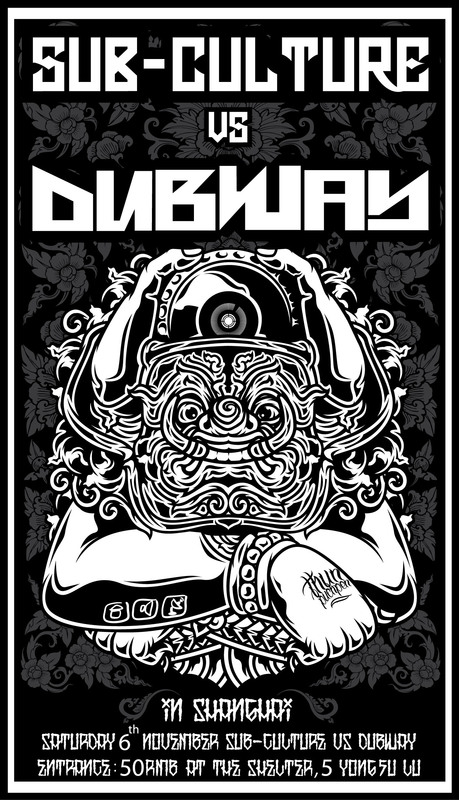 Big up to Idle Beats, Twoqee and all the other artists that have been involved in the Sub-Culture posters so far! Next months poster will be designed by Tony Burhouse, check out his blog here.